C&O Tractors are pleased to announce our latest finance offer for May and June. 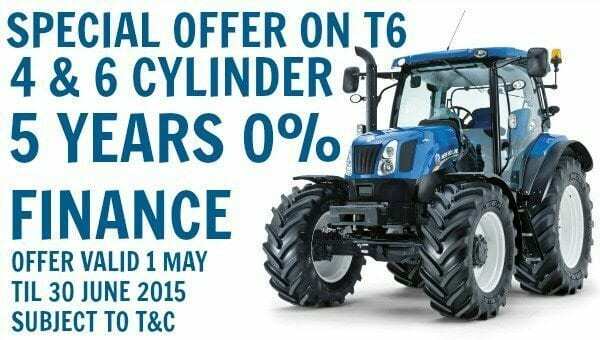 Available on both 4 and 6 cylinder T6 tractors we are offering 5 years at 0%. This offer runs from 1st May until 30th June 2015. *Based on max. amount financed 50% of retail price and trade in of £18,500. Specification T6.140 4 Cyl 120hp (140Hp boosted); 16 x 16 electro command transmission. Terms and conditions apply. Business purposes only. Documentation fee and VAT are payable upon signing. OTP fee payable where applicable. Finance offer valid on units with a retail contract date between 1st May 2015 and 30th June 2015. This is not a contractual offer and is subject to changes in prices, supply term, law or interest rates and may be withdrawn at the discretion of C&O Tractors.